For our trip to Isla Blanca we provide Free Transportation and hotel pick-ups at your hotel if you are staying in the Cancun Hotel Zone or Downtown Cancun. Pick up time is at 5:30am. We only do 8hr trips as the area is a lot bigger than Cancun and to get you to all the spots requires a longer boat ride. The chances of getting a Grand Slam or Super Slam are likely as the area is hardly fished and a lot of the water is so shallow that commercial fishing boats can not enter the area. The species we fish for are Tarpon, Snook, Permit, Bonefish, Sea Trout, Jacks, Snapper, and Ladyfish. The day in Cancun starts usually at 6:00am. We meet at our Marina which is located on the lagoon side between The Ritz Carlton Hotel and The Royal Sands Hotel. 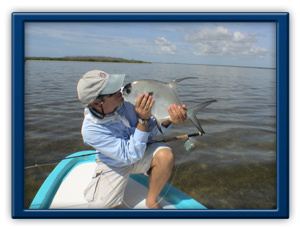 We fish Laguna Nichupte as well as Laguna Bojorquez which are both National Parks so no commercial fishing is allowed. The species we fish for are baby Tarpon, Snook, Snappers, Barracudas, and Jacks year round, and during the summer months Permit and Bonefish. Included in the trip: Your Guide, All fishing equipment (fly fishing and spinning tackle), Lures, Flies, and Leaders, Soft Drinks & Water, Box Lunch available on 6hr trips. 4 Hours - $275.00usd Book My Charter! 6 Hours - $350.00usd Book My Charter!